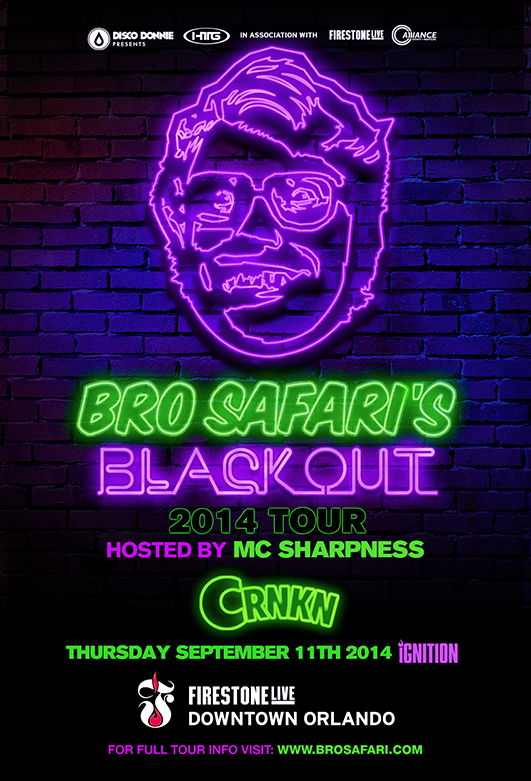 HTG Events and Disco Donnie Presents are proud to announce the Bro Safari Blackout Tour with CRNKN and MC Sharpness September 11th, 2014 at Firestone Live! Born in Atlanta, Bro Safari otherwise known as Nick Weiller, began his music career early. Starting in 2000 Nick and co-producers Ashley Jones (Treasure Fingers) and Mike Diasio (Computer Club) formed a group known as Evol Intent. Together they were an extremely talented American drum and bass group. It was around 2008 when the group finally released their debut album “Era of Diversion.” Not long after Nick Weiller began to focus on his moniker Bro Safari. It wasn’t until around 2012-2013 that the He started to gain recognition. Nick began taking the world by storm with his massive bass tracks ranging in genres from moombahton, trap, and dubstep. In 2013 Bro Safari struck a big success releasing singles “Scumbag” and “The Drop.” Bro Safari partnered with his long time collaborator UFO for the highly anticipated album Animal which was released on Soundcloud. The album quickly became a huge accomplishment receiving great accolades and pushes from a number of well-respected outlets. In a fitting cycle, they even included some raucous drum & bass tracks to the project, never forgetting where they came from. Tickets will be on sale Thursday, June 5, 2014 at 2pm EDT.